Voice-of-the-customer information is a vital part of new product development. Product managers and design engineers are charged with translating and analyzing it, testing concepts and ultimately turning them into viable products. To address these needs and develop the next generation of innovative evaporative cooling tower products, SPX Cooling Technologies focuses on voice-of-the-customer input, trade organization activities, and validation of new concepts through product testing. It’s not always easy to interpret what the market is signalling. At SPX, product managers regularly collect voice-of-the-customer information, analyze it, and translate it into new concepts that can ultimately turn into product specifications. Additionally, innovative ideas can emanate from industry organizations that monitor trends and regulations, such as the Cooling Technology Institute (CTI), Air-Conditioning, Heating, and Refrigeration Institute (AHRI), and American Society of Heating, Refrigerating and Air-Conditioning Engineers (ASHRAE). One example of an innovation that emerged directly from specific customer input is the Marley LW Fluid Cooler, an induced-draft counterflow closed-circuit fluid cooler. The design incorporates an innovative new heat transfer technology and a closed-circuit design that keeps the process fluid in a clean closed loop. In light of shrinking budgets and skilled labour pools, the LW Fluid Cooler is a response to market demand for products that offer installation and maintenance advantages. According to a contractor who installed the LW Fluid Cooler in a Columbus, Ohio office building, the arrival of the product at the job site fully assembled and factory wired makes a substantial difference and reduces total installation time to about one day. Electrical subcontracting costs are also minimized due to factory-wired controls. In addition, the LW Fluid Cooler utilizes electronically commutated (EC) direct drive fans that eliminate the need for a separate variable frequency drive and require virtually no maintenance. The new Fluid Cooler design was also installed at a Virginia Beach, Virginia hotel, where low sound was another deciding factor. The hotel operator especially appreciated that business could continue as usual during installation. While some fluid coolers can require four or five days to install, the LW Fluid Cooler was installed in one day. 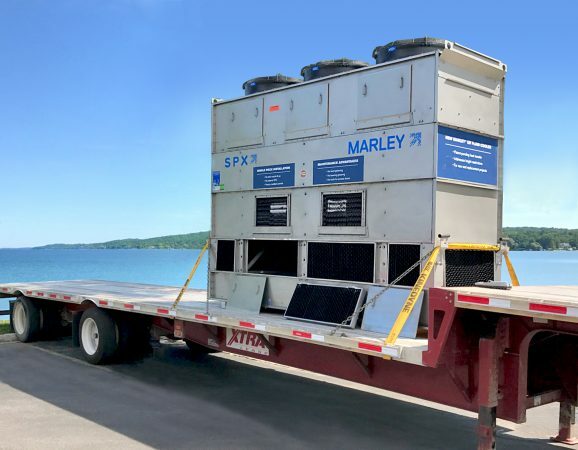 Another example of innovation driven by customers is the Marley NC Everest Cooling Tower, developed to address the need for higher cooling efficiency and quiet tower operation. The factory-assembled, crossflow tower design offers 50 per cent more cooling capacity per cell and uses up to 35 per cent less fan power per ton of cooling compared with other single-cell, factory-assembled cooling towers. In addition to lower energy costs, the new technology also significantly reduces HVAC system installation costs. The NC Everest tower’s larger per cell cooling capacity reduces the number of electrical and piping connections, which saves labor and material costs during assembly. The modular design speeds installation, a significant consideration, particularly for process cooling operations that need to replace the cooling tower but have only a short outage window to complete the project. For example, when a highly secure data center in New York couldn’t afford exposure to unauthorized personnel for an extended period of time, it efficiently replaced a field-erected cooling tower with an NC Everest Cooling Tower. At this site, it only took five business days to install 5,000 tons of cooling capacity. If the customer opted for a field-erected alternative, it likely would have taken six to eight weeks to complete. Regardless of application or industry, contractors and end users want products that install without complications, operate reliably throughout their service life, and do not require frequent maintenance. 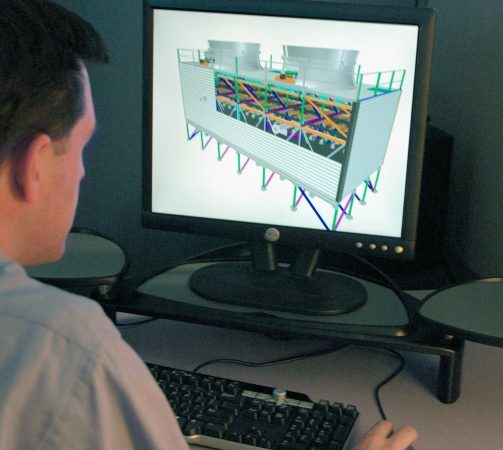 In addition to listening carefully to and understanding customer needs, SPX Cooling Technologies engineers and scientists actively participate in industry trade associations and monitor governmental agencies and other organizations that establish recommendations, guidelines and regulations that impact cooling tower design, operation and maintenance. For example, SPX is closely allied with ASHRAE and serves on various committees to improve safe and effective evaporative cooling, refrigerant uses and fan efficiency. SPX is a strong proponent of ASHRAE Standard 188 – Legionellosis: Risk Management for Building Water Systems, which provides guidance on the development and execution of effective cooling tower water management plans. SPX is also a member of the Alliance to Prevent Legionnaires’ Disease, a nonprofit coalition of health advocates, health providers, building engineers, scientists, water treatment experts and manufacturers, actively working to educate residents, building owners, policy makers, media representatives, water system managers and professionals, and government officials about the facts surrounding water quality, effective strategies for addressing the root causes of Legionnaires’, and better protecting public health. The SPX Research and Development Center, located in Kansas City, Missouri, generates and validates new product concepts, and conducts rigorous product testing to evaluate function and viability. The Research and Development Center also conducts continuous product training for SPX associates and commercial partners to ensure they understand the design and operation concepts behind Marley towers and components. Customers also frequently visit to view first hand tests of performance, efficiency and reliability of cooling towers and their components, which are designed and modeled in house. The SPX Research and Development Center is located in a climate-controlled, energy-efficient space that was originally a limestone cave. It occupies three acres underground, taking advantage of its controlled environment year-round. Above ground, seven acres provide ample space to build and test prototypes and new design concepts. Specific research areas of cooling tower technology include fan development, thermal performance testing, sound and vibration testing, water distribution, heat exchange fill media modelling and destructive testing. The technological advances identified at the Research and Development Center have helped establish global standards for process cooling and for individual components. SPX Cooling Technologies has been granted more than 181 U.S. patents for cooling tower designs and components. Mechanical contractors want reliable HVAC products that are faster and easier to install. The Marley LW Fluid Cooler, which ships in one piece and fully wired, typically installs in less than a day.